Policymakers last overhauled the corporate tax system 26 years ago. The economy, international trade and technology have changed drastically since then. The result is an outdated corporate tax code, which tax experts and business leaders say hinders rather than spurs U.S. competitiveness. President Obama and Mitt Romney have promised to do something about that and have made string of corporate tax reform proposals, but they differ on how to address the most problematic parts of the code. Common complaint No. 1: The United States has one of the highest statutory corporate tax rates in the world -- 35% -- a factor that may reduce business investment here. 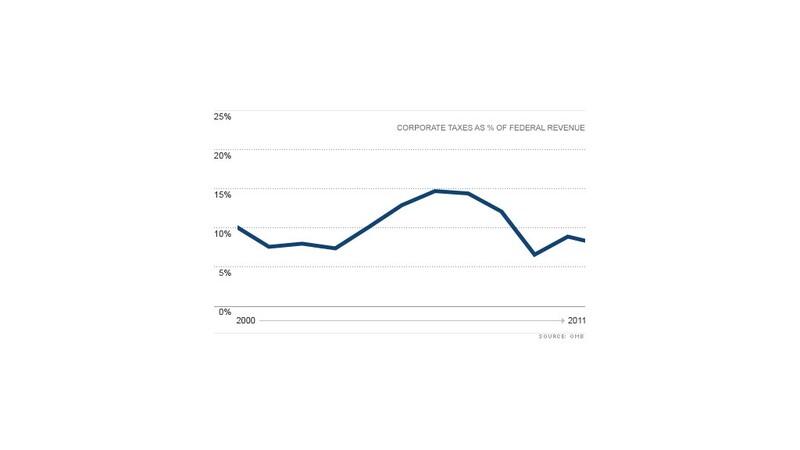 The flip side, however, is that large U.S. corporations often end up with effective tax rates (taxes paid divided by profits) far below 35%, thanks to a bevy of corporate tax breaks. If lawmakers lower the top statutory tax rate, making up for the potential loss in revenue will be hard to do. For example, even if lawmakers eliminated all corporate tax breaks -- a tall order -- that would only pay for a rate reduction to 28% or 29%. Common complaint No. 2: The United States still taxes profits earned abroad by U.S.-based multinational companies, whereas many other nations operate under a so-called territorial system, meaning they only tax corporate income earned within their borders. But it's also true that a U.S. multinational can postpone paying the federal tax owed on its foreign-based profits indefinitely. That's because the tax is only owed when the company chooses to bring those profits back to the United States. A territorial system could help U.S. multinationals that compete abroad in low-tax nations, according to the Tax Policy Center. By contrast, "the most important argument against a territorial system is that ... it would reinforce an already strong tax incentive to locate both economic activity and profits in low-tax countries," the center noted. And that could reduce the amount of corporate tax revenue flowing into U.S. coffers. Obama: Would lower the top corporate tax rate to 28% and pay for the rate reduction by eliminating "dozens" of business tax breaks. The effective tax rate for manufacturers would be capped at 25% and a manufacturing deduction would be increased, but the scope of those eligible to take it would be narrowed. A key goal of the administration's framework for corporate tax reform is to discourage companies from parking profits abroad. To that end, Obama wants to impose a new minimum tax rate on the foreign profits made by U.S. multinationals operating in low-tax countries. And he would require that the minimum tax rate be paid when the profits are earned, rather than let U.S. companies defer paying the tax owed until the money is brought back to the United States. If the company pays income tax to the host country on those profits, it would get a foreign tax credit under the Obama proposal. Companies that move their operations back to the United States would get a 20% tax credit. Those that move operations abroad would no longer be able to deduct moving expenses. Romney: Would lower the top rate to 25%, and his economic plan indicates the reduction might not stop there. "[Gov. Romney] will also explore the possibility of coupling further rate reductions with measures that broaden the income base and simplify the rules," the plan states. He would also repeal the corporate Alternative Minimum Tax and make the research and development credit permanent. In terms of international taxation, Romney would like to switch to a territorial system, so that profits earned abroad by U.S.-based multinationals would no longer be subject to U.S. tax.